In 2017 Zachary joined the Schwaba Law Firm, where he has channeled his desire to help people into working tirelessly to obtain recovery for his clients. Although Zachary primarily practices in motor vehicle accident litigation, he also has experience with worker’s compensation, dog bites, trip and falls, and more. 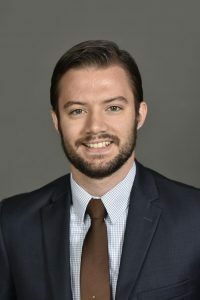 As a student at West Virginia University College of Law, Zachary earned various honors for competing in trial competitions, including finishing as a finalist in the school’s renowned Luger Trial Competition. Zachary graduated from law school in 2016 and moved to North Carolina, where he performed contract analysis for a company based in Huntersville. While working full time, Zachary passed the North Carolina Bar Exam and was licensed in August of 2016. Soon after, he began to pursue his passion of helping those in need by doing pro bono work on criminal cases, eventually arguing complex DNA issues in Mecklenburg County District Court. Zachary is a proud member of the North Carolina State Bar, the North Carolina State Bar Association, the North Carolina Advocates for Justice and the Mecklenburg County Bar.